Here’s a look at some of Friday’s most interesting high school football games. Bishop Gorman (1-0) at Bingham (Utah) (2-0) — The nation’s new No. 1 team will get a stiff test right off the bat. Gorman, which moved from No. 3 to No. 1 in the USA Today rankings this week after the two teams ahead of them lost, travels to a hostile environment in Utah. 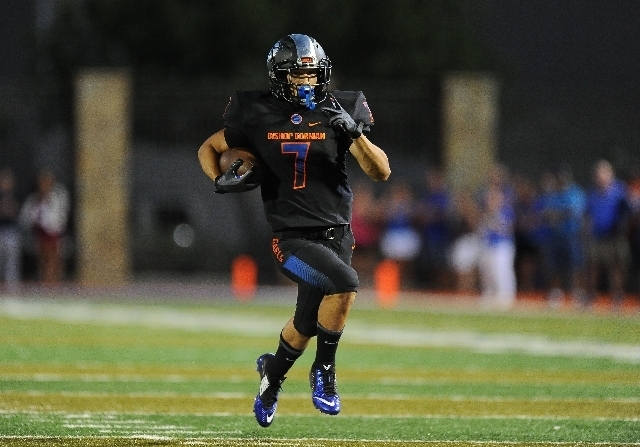 The Gaels needed overtime to edge the Miners 23-20 last season, and that game was at Gorman. This time, Bingham is on its home field where it has lost only two games since 2006. The Miners have recorded shutouts in each of their first two games, and have an outstanding front seven led by junior defensive linemen Langi Tuifua and Jayleen Tufele. Green Valley (0-1) at Las Vegas (0-0) — This team features a pair of teams searching for a new quarterback after losing three-year starters to graduation. Green Valley used three quarterbacks in its opener, and they combined to complete 22 of 34 passes (64.7 percent) for 203 yards. Green Valley’s ground game was even better, led by Austin Warhop (111 yards) and Nazhi Smith (93 yards). Junior Ronnie Broadhead and sophomore Zach Matlock both are expected to see time at quarterback for Las Vegas. The Wildcats have three strong returning receivers in Zacharry Loveland, Hanoie Rabago and Raul Perez, and running back Elijah Hicks rushed for 849 yards and 10 TDs last season as a freshman. Basic (0-0) at Palo Verde (1-0) — Basic is one of the area’s most experienced teams, led by quarterback Aeneas McAllister and defensive end Kendahl Blakely, who is one of nine returning starters on the defensive side of the ball. The Wolves, who advanced to the Sunrise Region title game last season after going 1-3 in the Southeast League, have a tough test against the Panthers, who opened the season with a 27-20 win at Coronado last week. Palo Verde racked up 232 yards on the ground in that game, led by Thaddeus Wiley (14 carries, 100 yards). Mililani (Hawaii) (3-0) at Liberty (0-1) — Liberty opened its season last week in Hawaii, but it didn’t turn out to be paradise as St. Louis High knocked off the Patriots, 43-16. Liberty is back home, but another Hawaiian headache looms. Mililani is ranked No. 24 by USA Today, and quarterback McKenzie Milton passed for 513 yards and six touchdowns yards last week. Liberty sophomore Kenyon Oblad passed for 281 yards and two TDs last week, but the Patriots need to improve on the ground after rushing for just 51 yards on 24 carries against St. Louis. Valley (0-0) at Rancho (0-1) — This isn’t a matchup of teams expected to compete for titles this season, but one of them will finally have something to feel good about. Rancho has lost 30 consecutive games, but the Rams are coming off a solid showing in a 13-6 loss to Gila Ridge (Ariz.) in their season opener. New starting quarterback Dion Southern passed for 90 yards and rushed for 108 against Gila Ridge. Valley’s losing streak isn’t as long as Rancho’s, but the Vikings went 0-9 last season. Their last win was a 74-15 rout of the Rams in the 2013 season finale. New Valley coach George Baker would certainly like to start off his season by ending that slide. Go to nevadapreps.com for a full schedule and complete scoreboard.